Most contemporary psychoanalysts and psychotherapists see each patient once or twice a week at most. As many patients have reached a marked state of distress before seeking treatment, this gives the analyst a difficult task to accomplish in what is a limited amount of time. A Casebook of Psychotherapy Practice with Challenging Patients: A modern Kleinian approach sets out a model for working with quite significantly disturbed, distressed, or resistant patients in a very limited time, which Robert Waska has termed "Modern Kleinian Therapy." Each chapter provides a vivid look into the moment-to-moment workings of a contemporary Kleinian focus on understanding projective identification, enactment, and acting out as well as the careful and thoughtful interpretive work necessary in these complex clinical situations. Individual psychotherapeutic work is represented throughout the book alongside instructive reports of psychoanalytic work with disturbed couples, and the more challenging patient is illustrated with several comprehensive reviews of films that follow such hard-to-reach individuals. 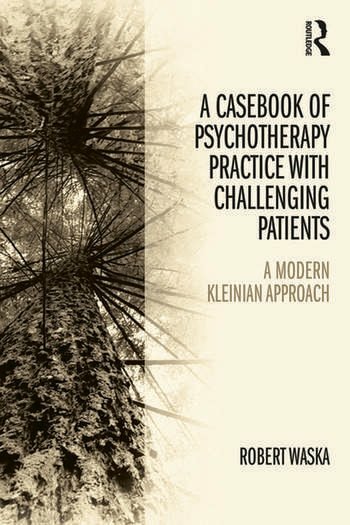 A Casebook of Psychotherapy Practice with Challenging Patients: A modern Kleinian approach is filled with a combination of contemporary theory building, a wealth of clinical vignettes, and practical advice. It is a hands-on guide for psychoanalysts and therapists who need to get to grips with complex psychoanalytic concepts in a short time and shows the therapeutic power the Modern Kleinian Therapy approach can have and how it can enable them to work most effectively with difficult patients. Robert Waska LPCC, MFT, PhD is an analytic member at the San Francisco Center for Psychoanalysis and conducts a full-time private psychoanalytic practice for individuals and couples in San Francisco and Marin County, California. He is the author of thirteen published textbooks on Kleinian psychoanalytic theory and technique, is a contributing author for three psychology texts, and has published over a hundred articles in professional journals. Acknowledgements. Introduction. One Patient’s Somatic Retreat from Unbearable Loss. Working with Psychotic Process. Depressive Conflict. Pushed to the Limits. The Problems of Immersion. Patients Marked by Crippling Loss. Pathological Organizations and Psychic Retreats. Couples Treatment from a Kleinian Perspective. Psychoanalytic Considerations of the Film "Another Year". Those Lost and Without: A Review of "Good Neighbors". Life and Death in the Counter-Transference. The Technical Challenges of Pre-Depressive Patients. Bibliography .